Here's a nice picture for a hot dry day. 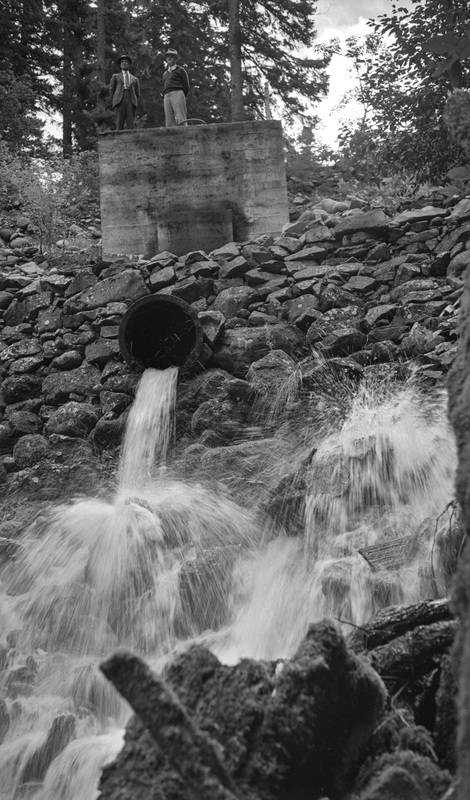 This is the overflow from one of the city's water sources in late August, 1941, as photographed by Alva Day. The overflow joins the waters from Lost Lake in the Lake Branch of the Hood River. Hood River built a pipeline up to this spring near Lost Lake in 1929. Water entered the pipeline at this box and traveled down to the city's 5,000,000 gallon reservoir. The pipeline was replaced in a project which was completed last year, though this spring looks much the same. You state the pipeline was replaced last year, is the city water source and pipe route the same ?. The city water source is the same, though the new pipeline was rerouted in some areas to follow roads for easier maintenance. Where was the reservoir? Was it the one that was just below the Hood River Hospital? Was the concrete box at the top of the indian cr. trail part of this whole thing? There is a large city reservoir on Portland Drive, and two smaller ones, one at the hospital and the second on Wilson. They are all enclosed tanks. The concrete structure at the top of the Indian Creek trail was for diversion into the industrial water power supply for all the industry along the railroad tracks. This was never part of the city's public water supply. Does the gpm vary? By season, or...? The most recent city water usage numbers I have are from 1999: 2.2 cfs average use, 4.1 cfs summer use. I know the new pipeline system allows easier tracking of flow, so I'll try to get some more recent numbers. 1999: average daily use 1.75 cfs, max daily 3.5 cfs. Since meters are read monthly I assume "max daily" is the average daily use for the highest month. The city has grown in population and also annexed land previously not on city water, so water usage per person is actually down.